Charlemagne: The First Holy Roman Emperor (742-814 CE) - Learn all about this famous and powerful king of France and Germany, who became the first emperor of the Holy Roman Empire. 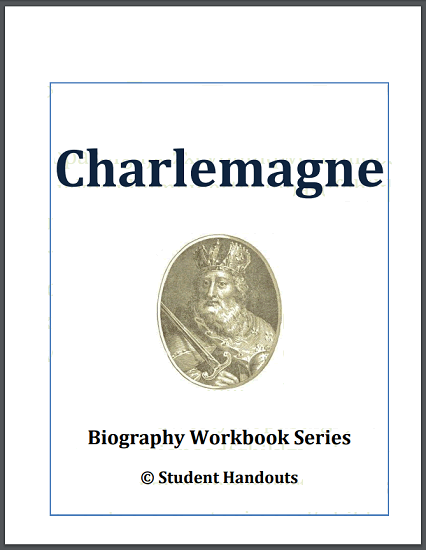 This Charlemagne biography workbook is 19 pages in length. What is the Biography Workbook Series? The Biography Workbook Series offers mini-unit workbooks on important figures from history. Brief chunks of informative text are interspersed with questions (ranging from basic recall to critical thinking) and fun activities. Each workbook can be completed in as little as an afternoon. These great workbooks serve as perfect supplements to a student's study of history, and function equally well as stand-alone units. Ideal for any student aged 12 and up. Click here to print. Answer Key: 1. A - Bertha, 2. B - False, 3. E - Urals, 4. Hunald, 5. Desiderata, 6. G - Mother of Charlemagne, 7. C - Father of Bertrada; maternal grandfather of Charlemagne, 8. A - Brother of Charlemagne, 9. F - First wife of Charlemagne, 10. E - Father of Desiderata; first father-in-law of Charlemagne, 11. H - Second wife of Charlemagne, 12. B - Duke of Aquitaine, 13. D - Father of Charlemagne, 14. Gilberga, 15. Frisian, 16. Irminsule, or Hermansaule, or Pillar of Hermann, 17. A - Charlemagne, 18. Pavia, 19. B - False, 20. Saxons, 21. They lost faith in their gods, 22. Dukes, 23. Counts, 24. Missi Dominici, 25. Ibn al Arabi, 26. Answers will vary, 27. Lupo, Duke of Gascony, 28. Adern, 29. Witikind, 30. A - annihilation, 31. E - encroachments, 32. D - effectually, 33. R - turbulent, 34. F - enmity, 35. C - ecclesiastical, 36. B - blockade, 37. G - feigned, 38. N - perilous, 39. S - tyranny, 40. M - liberal, 41. K - indignant, 42. O - rebellious, 43. H - fugitives, 44. J - incursions, 45. P - repudiated, 46. Q - thither, 47. I - implore, 48. L - infer, 49. T - whither, 50. They were killed, 51. 4,000, 52. Converted them to Christianity, 53. They disapproved of Charlemagne's marriage to Fastrada, 54. Answers will vary, 55. French metallurgists made superior arms; the exportation of arms would have helped France's enemies, 56. Greek empress, Irene, 57. A cloister, 58. Avars, 59. If Charlemagne was defeated, groups such as the Saxons would rebel, 60. Answers will vary, 61. Horses, 62. Charlemagne broke up the nation and had the Saxons dispersed throughout Europe, 63. D - plundering, 64. He purged himself of the crimes by a solemn oath, 65. Christmas Day, 800 C.E., 66. Nicephorus, 67. Louis, 68. Answers will vary.